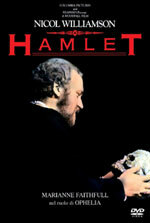 Based on the work of William Shakespeare (Hamlet) / Basato sull'opera di William Shakespeare (Amleto [Hamlet]). Perhaps the reason there are so many filmed versions of Hamlet is that in each decade every great Shakespeareian actor, and almost any movie actor with a yen to prove his versatility wants to tilt at this particular thespian windmill. Aside from the much more difficult King Lear, it is also one of the few plays by the master that can serve as a star vehicle. This 1969 version of the Bard's great play features the ardent mumblings of the actor Nicol Williamson, who brought his non-Standard British to the role. Williamson's esoteric enunciations were all the rage at the time of this film's revision of Shakespearian tradition, and his vocal mannerisms were arguably more authentic than usual. Scholars tell us that the English of Londoners in Shakespeare's time sounded very much like that spoken by Highland Scots today. Despite his stage success in the role, the vastly capable actor's magnetism was insufficient to make a popular success of this particular version. All the same, it is worth viewing on its own merits, and for supporting performances by future stars Anthony Hopkins and Anjelica Huston. Il principe Amleto è tormentato dal sospetto che tra la madre Gertrude e il fratello del defunto padre, Claudio, ci sia una relazione. Quando i due decidono di convolare a nozze, Amleto vorrebbe suicidarsi, ma il fantasma del padre si manifesta per dissuaderlo e svelargli che in realtà è stato Claudio ad ucciderlo.